Well, I went to the Dr. yesterday for my 3 hour glucose tolerance test. I had to drink 8 oz. of supposed "lemon lime" sugar water (which by the way I do not like lemon lime gatorade and that is exactly what it tasted like!). But the good news came only 3 short hours later...I do not have gestational diabetes this time! Yeah! 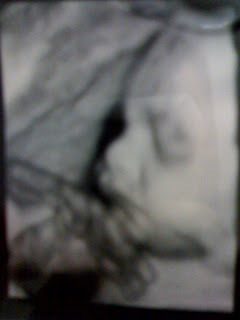 Also, while I was waiting I got an ultrasound of the baby boy! Here is a pic of him...hope this doesn't freak people out! He looks just like Addie Lee did at that stage! He is weighing over 3 pounds and measuring 29 1/2 weeks (FYI: I'm only 28 1/2 weeks). So it looks like we're blessed with another healthy baby! I can't wait to see him! P.S. My friend Alissa is having her baby boy tomorrow (Thursday) so y'all pray for both of them please. Well, it's official...Addie Lee loves farming just like her daddy. Dustin thought he would need a boy for that but he was wrong. 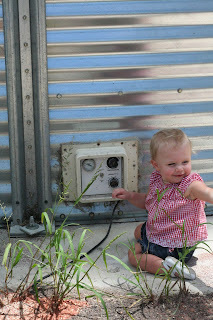 These pics are from a couple days we went to the farm to help out. She really loves to drive the combine and seems intrigued by all the happenings. 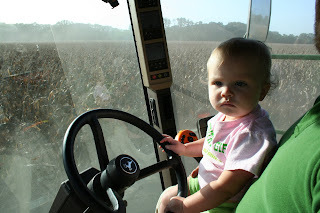 Addie Lee is focused as she drives the combine. 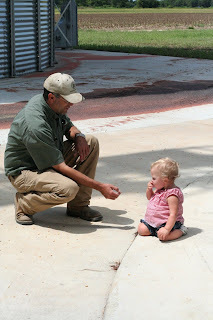 She really likes to hit the unload button so she can dump the corn on Uncle Bobo! 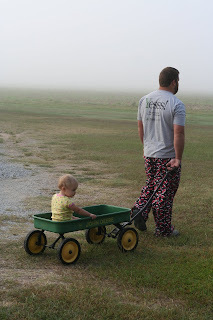 Dustin and Addie Lee riding around in her John Deere wagon. This is one of the days when our friends Matt and Nicole came up from BR to see us and watch Dustin harvest. We had such a great time with them! This is a pic from the grain bins, which Pop runs. Addie Lee thought she could pick up all the corn around the bins. Pop assured me that she was only eating the "clean corn." This is both of them examining it to be sure it was clean before she put it in her mouth! Wow! What does this button do? For more pics of our weekend with Matt and Nicole go to her blog at nicolvin.blogspot.com. By the way she is a great photographer and her pics are much better than mine! Ok, this is my first blog so hang in there...I'm not exactly sure how this is supposed to work! I want to keep everyone updated on my little ones though. Addie Lee is now walking everywhere and she thinks its great. Here are a few pics from our summer at the beach and her birthday party. We had a barnyard party and yes, I made the cake! 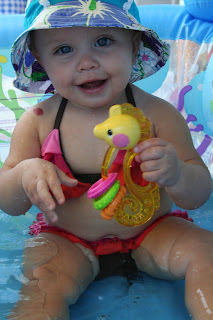 Addie Lee in her pool on the beach. Playing with Olivia's toys, of course! 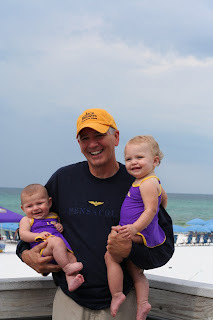 Doc, Olivia (Addie Lee's favorite cousin) and Addie Lee at the beach! 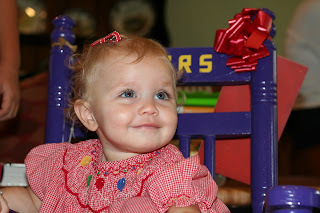 Addie Lee rocking in one of her favorite presents from her birthday party...her TIGERS rocking chair. She loves that thing! 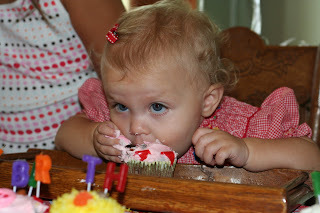 This is her eating a pig cupcake from the barn. She was hesitant at first because she knows she doesn't usually get to spread it all over her face like that!